Brandon Vitabile readies the snap. The senior center has had an illustrious career for the Wildcats, having started every game of his college career. 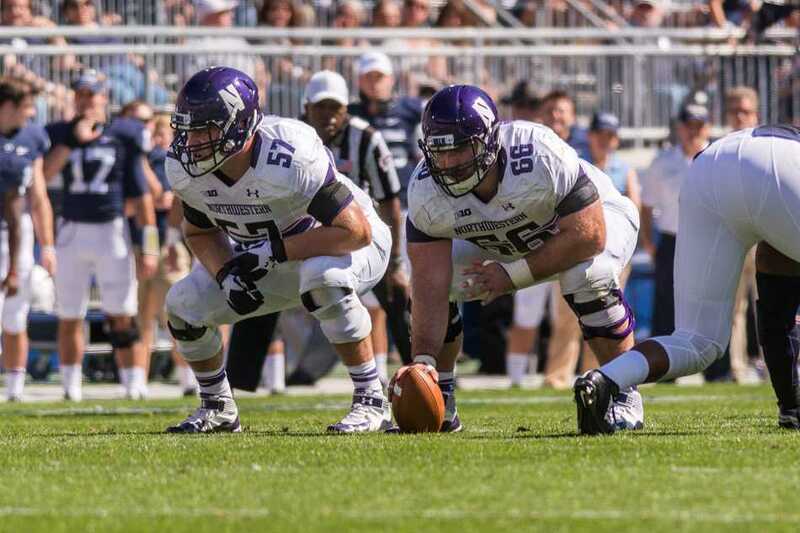 As the 2014 season closes, Northwestern’s football program is still in search of consistency. Consistent success on each play, in each game and ultimately each season. Consistency is important, especially for a team that follows a bowl-win season with a 1-7 conference record. Especially for a team that can lose at home to Northern Illinois but also hang 43 points on the road at Notre Dame. Amid the instability, the Wildcats have found one constant: center Brandon Vitabile. The senior, who has started every game as the offensive line’s man in the middle since his redshirt freshman year in 2011, has snapped the ball to five quarterbacks and seen the line around him shuffle but has brought high-caliber play since his first start. Of course, Vitabile earned his stability. It started after his redshirt year in 2010, when offensive line coach Adam Cushing sat down with Vitabile in what head coach Pat Fitzgerald termed a “come to Jesus” meeting. Fitzgerald described Vitabile as immature that redshirt year, saying the Edison, New Jersey native did not “take his role seriously.” Now, Vitabile describes himself as a “complete 180” degree turn removed from those days. After his meeting with Cushing and his practice baptism, Vitabile earned the starting spot at center for the 2011 season, and he’s held a kung fu grip on it ever since. This season, with “maturity” one of Fitzgerald’s buzz words, Vitabile has been nothing short of a revelation, “come to Jesus” meeting or not. Although the offensive line has had its ups and downs, Vitabile has been both a rock and a hard place in the middle. In the Cats’ upset win over Notre Dame, the line played its best game of the year. On redshirt freshman Matt Alviti’s first career touchdown run, it was Vitabile leading the way, pushing his man into the end zone before ending up on the turf next to Alviti. But Vitabile’s contributions to the offense are bigger than just what occurs on any single play, with Fitzgerald pointing to his experience as a key to the team’s success. Vitabile may share some attributes with his head coach when it comes to football, but off the field he’s carved his own niche as the Cats’ connection to the Jersey shore. Back on the East Coast, Vitabile enjoys a seemingly normal lifestyle, scooping grandma’s sauce on his pasta (which he doesn’t eat at school to help stay in shape) when he’s not hanging out at the local mall (a common social spot for a seventh grade Vitabile, a self-described “mallrat”) or exploring the sites of “Weird New Jersey.” At school, the economics major keeps busy with football, although he dabbles in innocuous pursuits such as television (“Sons of Anarchy” but not “True Detective”) and movies (He recently saw “Gone Girl” and left feeling weird about all his relationships with women). Even with Vitabile’s commitment to the zeitgeist, he’s found time to mold himself into a standout football player. With his college career coming to a close, he’s eyeing a professional career in football next. CBS Sports has him ranked as the sixth best center prospect in the 2015 draft class. In 2015, NU will continue to search for consistency. Unlike this year, that search will include the center position.